WOAH hi hey hello there, you may be forgiven for thinking this is nothing short of a miracle because I have been a little MIA for, well almost the whole year. Last year I was able to post a lot more regularly but year 13 commitments made blogging in 2015 a little tricky. My revision and attempts at keeping my life together (mostly involving screaming, crying, lying on my bedroom floor and drowning my sorrows in strawberry milkshake) left little time for blog photography and post writing which sucked because I missed it so much !! Despite now being completely out of the habit of writing and taking photos for this little corner of the internet I am determined to put out as many posts as I can now that summer is under way *squeals*. I understand if you've completely forgotten what I look like and didn't even realise Charlotte's Web still existed BUT I promise I have tonnes of ideas for posts coming up in the not so near future so stay tuned for all that exciting stuff. One of many changes that occurred since I last sat down and properly wrote for my blog was I got a hair cut. This seems v trivial now I'm writing it down however I did spend at least two weeks tweeting about how happy I was with it which probably means it was kinda a big deal. 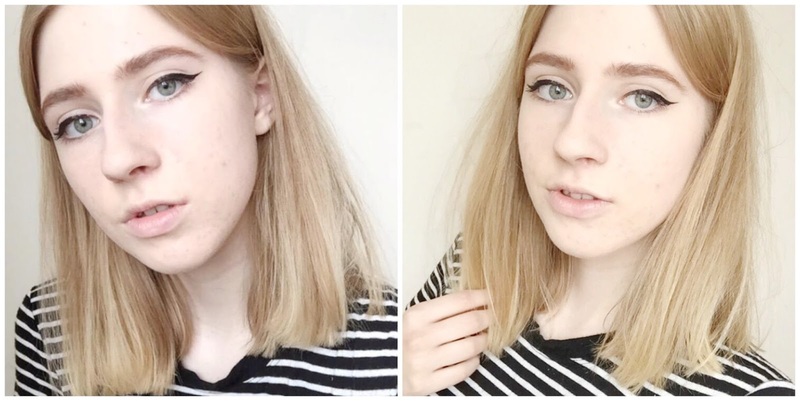 Since taking the plunge and getting a shorter and more swishy style I've got my hands on a few new products that have made life 128679 times easier and thought I would share them to ease myself back into this whole blogging thing (longest intro ever oh god can you tell I haven't done this in a while). The Tony and Guy sea salt spray has been a long time favourite of mine for adding grit and texture to my hair and to prevent that horrible 'I've definitely just washed my hair it's so fluffy I'm gonna die' (name that film) stage of styling. I like to spray a little into my hair after washing and when it's still a little damp and then blow dry my hair so that the product works into it and adds texture from the start of the styling process. I also like to spray a little onto second day hair to stop it from looking flat and it works really well for that too! All round a winner with me and who doesn't love a sea salt spray in summer right ?? Another spray that I love to use on damp hair is the Bumble and Bumble thickening hairspray. Despite the name, this is nothing like a traditional hairspray and has a liquid consistency similar to the salt spray. Bumble and Bumble are a little more pricey but it smells SO GOOD it's actually pretty hard to resist. Combined with the amount of texture this adds to my hair in stopping it from falling flat throughout the day this is a must have in my routine. Moving on to products I use on my hair once it's dry, I love love love a good texturising spray. I've had on and off love affairs with the Charles Worthington volume and bounce spray as well as VO5's 'give me texture' spray but currently I'm head over heels for Bumble and Bumble's dry spun finish spray. This seems to add instant texture and fullness to my hair which I love now that my locks are a lil bit shorter. I love how easy and quick it is to create a slightly messier finish with tonnes more volume with this product !! And finally, for the days when I'm feeling a little more lazy (read: every day) Batiste is my life saver. 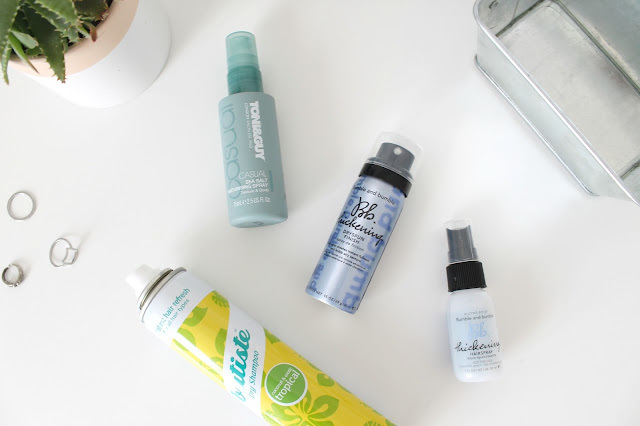 Dry shampoo is a staple for me not only for those days when I roll out of bed a little too late but also when I have freshly washed hair and to add texture making styling SO much easier. 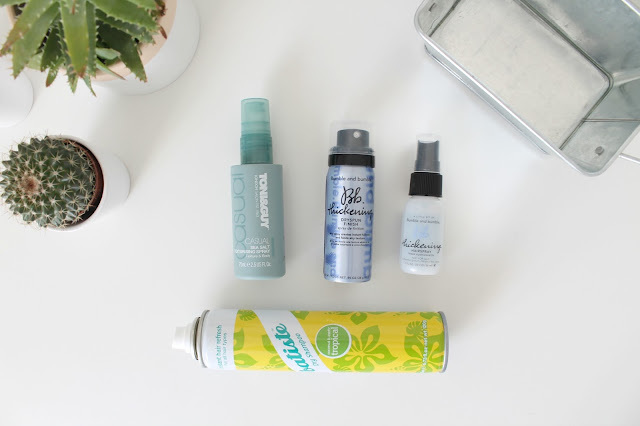 I particularly like the tropical scented dry shampoo for summer but they have so so many varieties that you will have more than enough to choose from !! I hope this post was somewhat helpful and if you made it to the end (or even clicked on the post at all, again v sorry about my absence) then thank you! Hopefully there will be lots more posts up soon so bear with me *crosses fingers*.